The decades-old lines that define the New Orleans Police Department’s individual districts will likely be redrawn in the coming year using computer deployment software, Superintendent Ronal Serpas told the City Council. 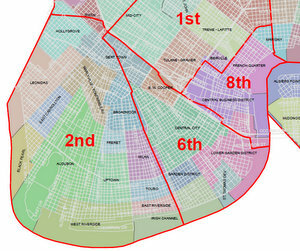 During Monday’s review of the New Orleans Police Department budget, Councilman Jon Johnson asked Serpas why the geographically-largest police district, the Seventh (in the eastern part of the city), had fewer officers than the Eighth District, which covers the French Quarter. Part of the difference has to do with the relative population densities of each area and the fact that the Eighth District receives the majority of the city’s tourist population, Serpas said, but admitted the staffing levels are long overdue for an update. The answer, Serpas said, will come in the form of a computerized assessment of the city’s police deployments that will likely recommend redrawing some of the district lines to even out the workloads between them. With more consistent expectations about call volumes from specific shifts, supervisors can then be more proactive in scheduling community policing, Serpas said. The department has just been approved to use $300,000 in federal stimulus money to purchase the program, which will not take long to run once it is installed, Serpas said. Johnson sought assurance that this process would bring relief to the Seventh District, but Serpas deferred to the results of the program. “I’m just really looking forward to getting some justice here,” Johnson said. Serpas urged the council to brace themselves for what could be radical recommendations from the program. Other than a few minor changes in 2000, the district lines in New Orleans have been substantively the same for 50 years. By contrast, at his last job in Nashville, the district lines were redrawn every other year.